How Long Can Daylilies Stay Out of the Ground? Q: My daylilies are finished blooming for the summer. The leaves are dried up. I am wondering if I can cut the plants back. They are dead looking and need to be thinned out also. When is the best time to cut back and divide them? We are suffering a severe drought at this time so they are a little ahead of the normal schedule. Daylilies, members of the genus Hemerocallis, are brightly colored flowers that bloom during mid summer. Daylilies range in color from near white through yellow, orange, and red, to brown and violet. Very low maintenance, these perennial flowers are very low maintenance and need little special care. Daylilies will grow in almost any kind of soil and bloom best in full sun. Dividing them from time to time will encourage them produce more flowers. Late summer or early fall are the best times for cutting back your daylilies. When cutting back, use your hands to pull off any dead foliage and then cut back the rest of the leaves to within a few inches of the ground. Late summer is the best time for dividing daylilies. Early September is best, their roots will have time to grow before winter. 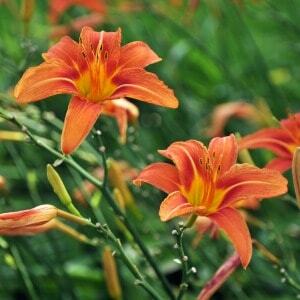 It is easiest to remove your daylilies from the ground by using a garden fork to lift the clump from the ground. Start by placing the fork in the ground 6 to 12 inches away from the base of the plant. Gently push down on the handle to pry the clump up and out of the soil. Work around the root ball repeating this process until the roots are freed. Take a look at the the root ball and look for weak areas at the center of the clump. Plunge two garden forks, placed back to back, into the clump. After the forks are fully inserted, gently push the handles apart. This will cause the roots to separate, forming two smaller clumps. If you want more divisions, you can repeat this process until you have the desired number of root clumps. To re-plant the daylilies you have just separated, dig a wide shallow hole. The depth should be slightly less than the height of the rootball. The width of the hole should be 6 to 9 inches greater than the width of the rootball. Place the rootball in the hole and backfill with soil. Lightly tamp the soil into place. Apply mulch to a depth of one inch to discourage weeds and protect the roots from drying out and from temperature extremes. The area should be watered thoroughly. The foliage can also be cut back to a length of about 12 inches, which helps the plant retain moisture while it is getting established. Daylilies are very hard plants, and hard to kill. They can stay out of the ground for quite some time as long as they get some water occasionally. 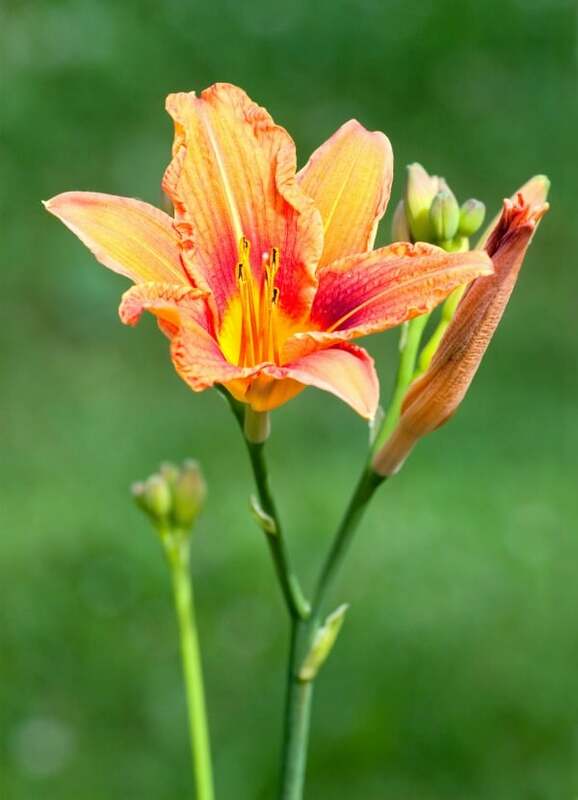 If you are going to leave them out of the ground for a month or two, place something between the plants and the ground, such as a sheet of plastic, or the daylilies will try to take root in into the ground right where they are. If they are going to be out of the ground for some time, place them in a five gallon container in a little water to keep the roots moist. Your divided daylilies will continue to bloom for years to come. Most daylily varieties may be left untouched for a period of four or five years before they need to be divided again. This document incorporates information from gardening experts at the United States National Arboretum. Why Doesn’t My Hydrangea Bloom?